First, I will say that I am going to give the movie 2.5 out of 5 stars. It was an ok movie over all, but there were some real problems with it. Some of that really does have to do with the reboot thing and some of them just have to do with the movie itself. Over all I am really ok with the changes that they made to the story. My problem is not with those changes, my problems is really that they didn’t make enough changes to make this a new story instead of a telling of an old story. I hesitate to write this review because I made a pretty big stink about how much I don’t like reboots. The problem is that I really do want to talk about this movie. I really enjoy Star Trek. I am a complete “trekie” and I know it. If I just left it out there and didn’t say anything more I feel like I would be not doing my job as a “trekie” to promote the franchise that I really do support. Yes, I still do like Star Trek. No, I don’t think J. J. Abrams has totally ruined the franchise. But yes, I am still not totally happy with this movie. Star Trek Into Darkness is a visually stunning film. It is really beautiful. If nothing else could be said for the film there was that. I do mostly like the updated look and feel of the Enterprise, though sometimes I do long for the less cluttered look of the ships shown in the television series. I do like that they used a real science lab for some of the exterior shots of the warp Engine. The story line itself was not bad, and the pacing of the film was about what you would expect for an action thriller. All in all, if you are looking for a movie to go see, I would say that this is not a bad choice. I am not a fan of the relationship between Spock and Uhura. It is not because of the changes in Spock from the non-feeling Vulcan, to who he is now, but because this just really feels forced. It feels like they said, you have to have a love interest and so we’ll toss this one in there. It does not work for me at all. Kirk’s lecherous behavior really had the same feel to it. It was just in there to show it, not to add any value to the movie or characters as a whole. So why did I give it a 2.5 out of 5, it can’t be just because I don’t like the love interest between Spock and Uhura. Simple it is a reboot of a property that didn’t need a reboot. This movie spent so much time trying to convince you it was not a reboot, when they really should have told you another story. Here is where I will talk about the reboot. Let’s talk about that definition for a moment. If you are rebooting a movie you basically are telling the same story just with little twists and turns, maybe some updated effects and change and add some characters to update the movie. The one major change from the original to this movie is the role reversal of Kirk and Spock. In The Wrath of Khan Kirk takes control of the Enterprise from Spock because his has, over and over again proven that he is the best person for the job, and he really is. Into Darkness on the other hand goes to lengths to prove that Kirk is not that person (though he is getting there) and he actually gives the ship back to Spock so that he can do the action hero stuff. He is not the Captain they need at the moment. But all this does is reverse the roles of the two main characters and put Kirk in the the position to risk his life so the ship can be saved where in The Wrath of Khan Spock was in that position. Many people will tell you that this movie does not qualify as a reboot because the story line is not entirely the same. I argue that it really is. It starts with a decision by Kirk that despite his personal desire for revenge and against orders (or regulations) Kirk decides to let Khan live. (If you are wondering what I am talking about go back and watch Space Seed) Kirk shows mercy, and in the end it almost gets him killed. To illustrate this further, here are a list of some of the major plot points and devices that were in The Wrath of Khan / Space Seed and also in the new movie. This is not in the slightest a complete list, but I think that if you think about it you will see what I mean. Yes, I do realize that just because they have some of the same points and devices is does not make it the same story, but these are really a pretty big deal. 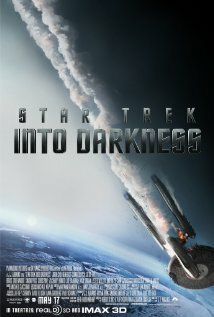 In Into Darkness Kirk thinks he is about to be promoted, but instead get demoted to first officer. The Genesis Torpedo which can bring life and can be incredibly destructive. He is angry at Kirk for leaving him on Ceti Alpha 5, a disaster happened that Kirk had nothing to do with but resulted in the deaths of many of his people including his beloved wife. Khan is being used by an admiral to build a new fleet with the threat of we will kill all your people if you don’t help. Kirk after being marooned on Regula angry at the death of his friends and the attack on the ship. KHAAAAAAAAAAAN! Spock, after the death of Kirk KHAAAAAAAAAAAAN! In the end it is these things and many others like them that really are the downfall of this movie. My point is they should have left The Wrath Of Khan alone. There is just too much else out there for them to have to come back to this one. I know people are tired of me talking about this. But here is why I keep doing it anyway. Star Trek is an incredibly rich universe. Rodenberry had this incredible vision of the future that gave us all hope. This universe deserves to be carried on. I am not opposed to them making changes. I am not opposed to them not following canon, and I don’t hate this movie. It is that they didn’t tell us a new story. That was why people went back to the movies to see Star Trek Films even when the last one didn’t do so great. They didn’t go to the Movies are turn on the television to see retellings of older stories. This is why Star Trek the Next Generation was not what everyone hope for in the first season. They stuck too much with the old series instead of trying to make their own way. That is why when they did start going out on their own people came back to it. The fans go to the new Star Trek movies expecting a bold new world seeking out new life and new civilizations and boldly going where no man has gone before. Unfortunately I think they are not going to find it here. Previous Ah Summer Time – Where Are Those Lazy Days? There wasn’t any part in the movie where I was bored, I was hooked the entire film. Good review. Thank you. Like I said, I didn’t hate the movie. I was just really disappointed they didn’t pick a different subject.